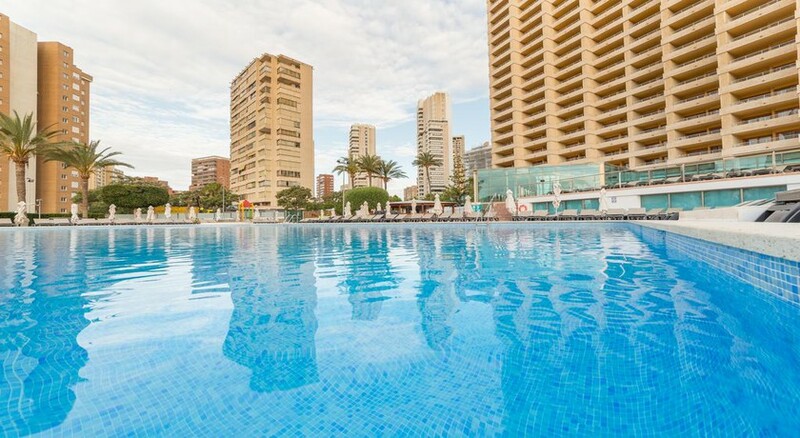 Sandos Benidorm Suites is a fabulous, modern all-suite hotel, perfect for families and couples alike. With world-class facilities on offer, including an Indian restaurant, three bars, large swimming pools and an excellent all-inclusive packages will never make you leave this place. The best feature of the hotel is its proximity to the beach and to other tourist destinations. This place is definitely one for music fans as the hotel hosts music nights and regular live shows. The hotel's rooms are spacious, comfy, modern and offer a restful retreat. With all these incredible features, no wonder Sandos Benidorm Suites is one of Benidorm’s most popular hotels. 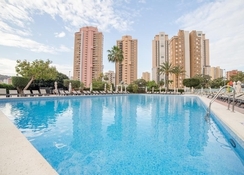 Sandos Benidorm Suites is a fabulous property located in Benidorm. 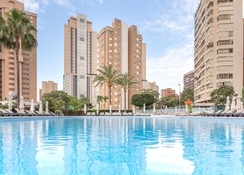 With only 1 km from the lively Levante Beach and 1.5 km from the heart of Benidorm’s downtown, you have everything around what you wish for. The hotel's suites are perched on one of the tallest buildings in Spain, meaning you enjoy a panoramic view of the surroundings. Plus, you've various recreational areas and attractions in the neighbourhood, including restaurants, bars, clubs, shops, and a few iconic landmarks. A few beaches around the hotel include Benidorm Levante, Finestrat, Poniente and Albir beaches. The nearest airport is Alicante Airport (58km). Rooms in Sandos Benidorm Suites are furnished into Suites with pool view and Suite with pool view wellness pack. Perfectly designed to offer comfort and luxury to the guests, all the room categories come with a living room, sofa bed and en suite with all basic amenities. Other facilities include air conditioning, hairdryer, cribs, electric kettle, safe deposit box, telephone, TV with satellite and WiFi internet. The suites also offer twin beds and double bed—depending on availability. Housekeeping, changing of towels and bedding are provides every day—extra bed is available on request. 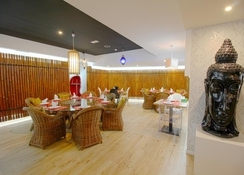 The hotel's main restaurant serves breakfast, lunch and dinner in buffet style with show cooking and various international cuisines like Mexican, Italian, Oriental, but mainly Indian. There are theme nights to keep things varied, so one evening you could be eating an onion bhaji, and the next you’ll be tucking into a burrito. Then there're Rock & Sports Bar and the La Bamba, perfect to enjoy lively evening supping some interesting cocktails. You won’t be rubbing elbows with your fellow swimmers on the outdoor terrace – the pool is enormous and there are sun loungers galore – food and drinks are served too. There’s a smaller swimming spot for the kids, too. You can take your relaxation at the wellness centre that comes equipped with Finnish sauna, gym and more. And on the ground floor, there is a game arcade that can be shared by both adults and kids. You will find billiards, darts, table tennis, video games and more. The hotel also hosts musical theme week, a new feature that’s a must watch. - Daily bed cover and night sweet. - Special amenities and bathrobe in the room. - Welcome botle of sparkling wine. - Cofee and tea making facilities daily replaced. - Minibar with sof drinks, water and beer on arrival. - Safety deposit box in the room with no charge. - 15% discount in massages and treatments. - Select Club Lounge*: a private and exclusive lounge who have chosen Sandos Select service, equipped with a free internet corner, TV, daily newspapers, tea, cofee, sof drinks, snacks and high quality premium drinks. - 1 Outdoor swimming pool and one for little children. - Teens Lounge: from 12 to 17.99 years with PS4. - Kids Lounge: from 4 to 11.99 years, with Wii. - Visa, MasterCard y American Express accepted. - Wellness centre: Gym, Massage Cabins**, Aesthetic cabin**, Finnish Sauna. - Breakfast, lunch and dinner in buffet service. - House wine, water, soft drinks and draft beer at lunch and dinner. - Draft beer, tea, coffee, soft drinks, water, house wine and locally produced alcoholic beverages and cocktails (from 10 am until 24pm). - Snacks available between main meals. - Ice pops available in summer time. - Sport activities: billiards**, table tennis and water sports and games in summer season. - Nightly entertainment: shows, music halls and theme nights. - Teens Lounge: from 12 to 17.99 years, with PS4. From this next winter They will begin to do more concerts, more often, but of less known groups, and once a year there will be doing a major concert. These minor concerts will be without supplement. We will send you information about the major concert as soon as possible. 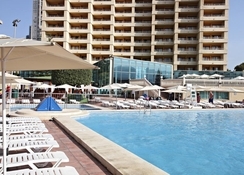 - 1 entrnce to the Spa cirquit of Sandos Mónaco per person and stay. It was an absolute pleasure staying in this hotel. The staff were very friendly and couldn’t do enough to make our stay a very good experience. The food was good and the drinks included with the all inclusive were also good. No shortage of measures and not watered down. The beer was served in half pints but you could bring your own pint glass if you wanted to. The entertainment was also very good. The only thing I would say is if you have children to watch them on the veranda as the safety rail is quite low. I would definitely book this again. This hotel was located in just the right place for me and my wife . About 10 min stroll to the front with hustle and bustle if you wanted that. Food was great plenty of choice and tasty,Rooms where very spacious and clean and staff very helpful. We only stayed for 4 nights but will definitely be back . Stayed with my boyfriend for 1 week in July. The hotel was amazing great value for money. The rooms were very big and stylish and the balcony was massive!! The staff could not do enough for you, amazing activities throughout the day and shows on at night. Great if you have a family but also great if you don’t. The snack bar outside was amazing, kebabs, burgers, nuggets, chips, pizza all day long so you never go hungry. The restaurant food was amazing too, there is also a Indian restaurant with one free meal included. It was OK but would probably go to an actual Indian restaurant if you want a proper curry. Location was also great, 5 mins walk from sea front. I also paid for a 1hour massage treatment!! Was amazing :) would Defo go back if I go to Benidorm again!! Amazing staff , and food always something nice, I am so funny don't eat meat if away as you never know but at the Sandos all joints of meat carved infront . Absolutely fantastic hotel. Staff superb. Entertainment some of the best I’ve seen. Food was out of this world. All in all ⭐️⭐️⭐️⭐️⭐️ Been back twice this year already and going back again later this year. So that says it all. Booked through teletext and it was superb.